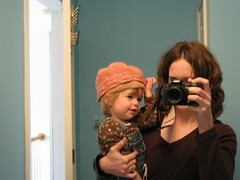 Hat #7 / 52, a test knit for Shazzasknits on Ravelry – a cupcake hat. 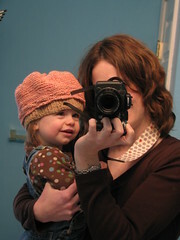 Total stashbuster for me, quick to knit, cute – I especially like the “icing” construction. 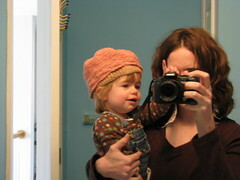 Lorelai is sadly no longer willing to put up with hats, but it was cute! 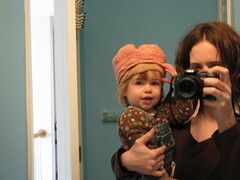 Take it from me, bathroom self-portraits are difficult enough, but even more so with a wiggly toddler who wants to push the camera buttons and take off the hat. Excuse the blurriness and my bad hair day. Yarn details and such on my Ravelry Project Page. Apparently Connecticut is going to skip spring and jump right into summer. I’m sort of ok with that. The humidity is low, so it isn’t too bad. 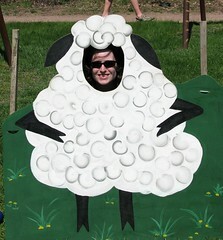 On Saturday, like so many other knitters, Theatreknitter and I trekked out to the CT Sheep and Wool Festival. It was such a nice day out and the festival was a good size – it’s small, but still very enjoyable. 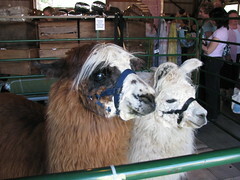 I would compare it to Rhinebeck being like the Durham Fair and CTSW being the Guilford Fair (or whatever small town). As we walked around I kept thinking to myself, oooh! That vendor is from Putnam! That vendor is from CT, that vendor is from MA (well DUH! 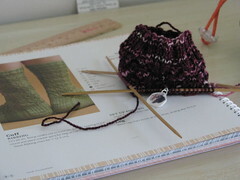 I was knitting with the short end of the yarn then.) I liked being able to see these local vendors and support them – they were all quite friendly and had great stuff! 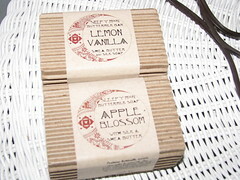 2 Sleepy Moon Soaps – Lemon Vanilla & Apple Blossom. I didn’t realize until just now writing this post that my MIL gave me a bar of soap from Sleepy Moon for Christmas! – I can tell you I have had the soap in my shower since then, used daily and it is just now getting down to the bits! Fabulous! 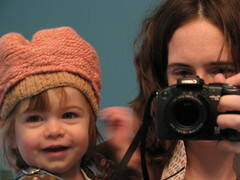 Currently holding J.Knits “Florida” – it’s going to be a plain stockinette sock for when Lorelai is walking around outside. 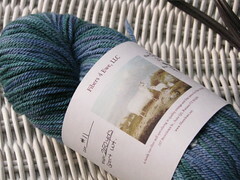 A skein from Fibers4Ewe – they’re from Putnam! I used to live in that part of the state! I also got the chance to meet and say “Hi” to several local knitters that I either attend SnB with, read blogs of, talk to through Ravelry. 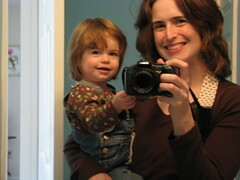 So, hello again to Betsy, jennsquared, Archiknist, SunflowerFairy, Gale, Ladysslipper, LilithParker, Live and Let Learn…. I looked for but missed CTJen and thepaintedsheep. I wore my “Daily Dose of Fiber” Ravelry shirt which garnered many comments, as did my “Knit or Go Home” (inspired by a Gilmore Girls episode, found on cafepress). Many people I met were asking for the Lorax. Maybe next year. I think I could have brought her, but she’s a bit too much touch and go still. 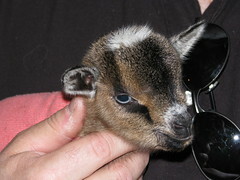 Maybe at Rhinebeck I will walk around with a cut-out picture of her or Jackson – then more people would know me! 🙂 I’ve got a Lorax post and will get on that shortly! First off, the concert on Saturday was fantastic. I am still amused by the fact that *I was in the audience*!!! for these recordings! (Links to YouTube)Power of Two, Digging for Your Dream,and I’ll Change. Considering the Girls have been around for 20+ years, it’s impressive that they covered pretty much all of their work – I think there was a song from each album at least. The best part for me has two parts – first, third song of the set they played “Hammer & a Nail” which I do consider to be a personal theme song. Second, they played “Kid Fears”! Never thought I would hear that done live – Shawn Mullins sang with them and was great! I plan to look into more of his stuff – I really enjoyed it. Seriously. How do you plan for a bank full of nuns? Perfect. Ah, life. The mundane has been all consuming lately, so I’ll keep this brief. My dad is on the mend from his surgery (yay! ), we all got hit with a cold (boo! 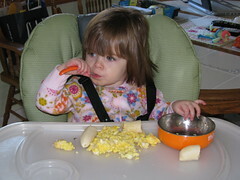 ), we hosted Easter (it was nice), Lorelai has really started pushing her boundaries / limits – she’s thrown a temper tantrum or three this week and has started saying No. Yeah, good times. 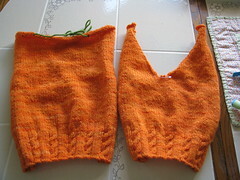 I thought it was time to start seaming, but the instructions say to do the hood first. I’m considering what I want to do with it next. 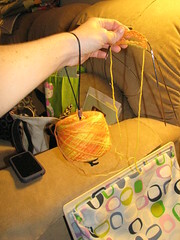 I’ve got a second bolero in the works for Schaefer yarn. 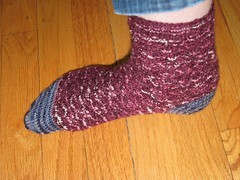 I’m going to do another sample knit for Lorna’s Laces. And tonight I’m off to see the Indigo Girls!! *Closer I am to fine! 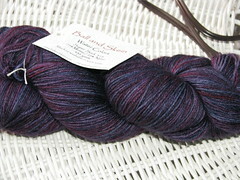 Way back when, I bought yarn from Ruby Sapphire Yarn‘s etsy shop. They had so many great colorways that had people names – I had to have “Bekka” (my name, different spelling), “Kathy” (mom) and then I spotted “Hope” – my Nana’s name. 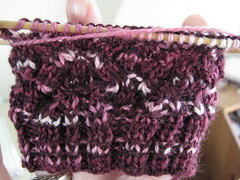 Fantastic shades of maroon / burgandy / pink – totally colors Nana would wear. 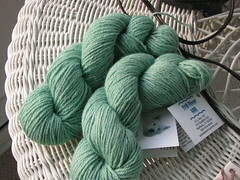 I even ordered a custom shade, “Donald” (Grampa’s name), in shades of blues-greys almost stormy ocean. Grampa was in the Navy and loved to sail. So it has become MY “keep ’em with you scarf” and I have knit on it for the last 2.5 – 3 years. 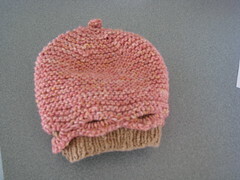 I have knit on it while sitting with my mom at the hospital when my dad has gone for procedures. 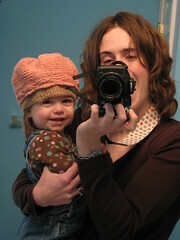 I knit on this scarf when I was in labor. I knit on this scarf while attending Rhinebeck with knitting friends (and I messed up and it got a touch of good juju from the Yarn Harlot). The scarf means a lot to me. And finally, it’s done. Last weekend, I cast off. 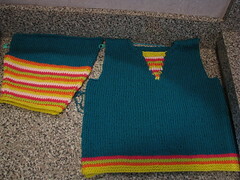 Unblocked I can loop it around my neck and the ends still reach to my elbows. Appropriately in a strange way it was finished on the anniversary of Nana’s passing. I recently received my copy of Cookie A’s Sock Innovation – what a fantastic book! I took it to a local copy shop and had them put on a spiral binding. 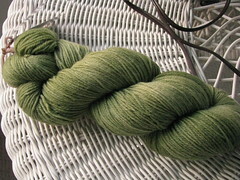 I’m working on Glynis the Hope colorway. 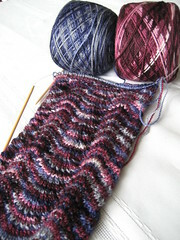 I think the colorway may be too busy for the pattern (it may be too early to tell for sure) but I’m sticking with it. I liked the description in the book about the “real-life” Glynis, and that reminded me of my Nana. She, a non-swimmer / non-beach person, spent 9 months on a sailboat with my grandfather back in 1993 – it was his lifelong dream and she stuck it out – but I remember the look in her eyes when we would hang out too close to the side of the boat! I plan to make the legs a little shorter as I am not sure how much I used in the Chevron Scarf, but the skeins were generous to begin with (550 yds!) I am considering an afterthought heel (it would be my first) and definitely a different colored toe (using what else – the Donald colorway). These yarns have to be knit together. Hope + Donald = True Love Forever!